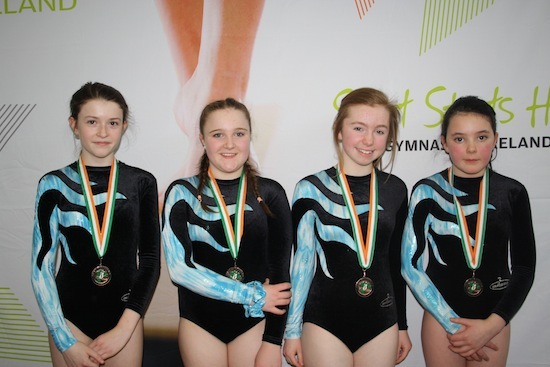 CONGRATULATIONS to the local girls gymnastics team who represented the Northern Region and won third place in the Gymnastics National Team Championships in Clones, Monaghan, held by Gymnastics Ireland at the weekend. The girls beat off stiff competition from teams all over Ireland to win third place. Pictured from left to right are Aoife O’Connor, Emma Doherty, Kerrie McGuigan & Natasha Tinney. The girls are members of Letterkenny Community Gymnastics Club and were coached for the compettion by Jessie Purtill and Sarah McGlinchey. Other competitors who took part from Letterkenny Community Gymnastics Club included Emily O’Connor, Ella Khaviam Ava Beth Kerr, Tamara Blaney, Serena McArdle, Mia McGarrigle, Katie McGovern, Annemarie Cunningham, Rosemary Lane and Vania Ashman. “The girls all worked so hard and be very proud of their achievements,” says club spokeswoman Sarah.